When studying popular entertainment across cultures, "the same only different" is easy to spot. Samurai dramas and westerns, for example. But perhaps more compelling are the curious outliers in genres that appear on the surface to closely mirror each other. The detective series and the police (and now CSI) procedural are pretty ubiquitous around the world. Once you've adjusted for culture quirks and legal differences, a British series and an American series and a Japanese series mostly share the same storytelling space. 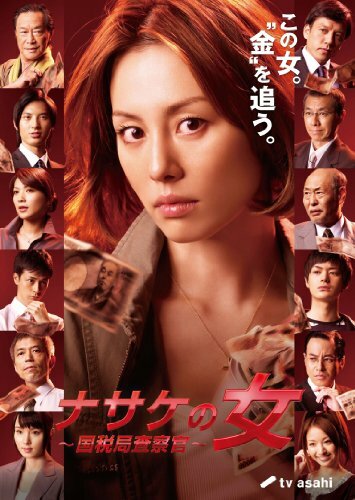 But there is one particular genre of the police procedural on Japanese television that you're not going to see anytime soon in the U.S.: the IRS agent. Seriously. For the past several years, a new series about heroic tax inspectors has debuted almost every season. Actually, there is an American precedent: The Untouchables. Al Capone was ultimately sent to jail by Treasury Department inspectors led by Eliot Ness. The television series and movie, though, are more shoot-'em-up actioners than adventures in forensic accounting. That's exactly what these Japanese shows are about. They owe a lot to A Taxing Woman and its sequel, Juzo Itami's critically acclaimed 1987 and 1988 films about a tenacious government tax investigator. Of course, the conflicts are spiced up for entertainment purposes. We watch them going after the big fish, not the sympathetic small fry. The protagonist is the expected combination of tenacious genius and rugged nonconformist (and if a woman, she's probably really hot). In the current offering (the tagline: "This woman chases money"), Ryoko Yonekura has a ball playing against type as a frumpy, eccentric, Columbo-style investigator (albeit with a supermodel bod). The puzzle is why Japan has such an abundance of tax cheats that tax inspectors are celebrated. In places like Greece, many of their financial woes boil down to the fact that everybody cheats on their taxes. In Japan, the conviction is that only the undeserving rich are doing so. The reasons can in part be traced back to practices that date to the 19th century, such as the wide use of promissory notes and accepting signature stamps (hanko) as valid forms of identity. The sure sign of a tax cheat is a stash of bank books and hanko stamps. But at the root of the problem is that even in the 21st century, Japan remains a largely cash-based society. For practical purposes, personal checking accounts don't exist. Credit cards have become widely accepted only in the last decade or so. Most financial transactions are done in cash or by wire transfer. When ATMs appeared in the 1970s, so did the ability to wire money via the ATM. The ATM wire transfer process has become so rife with fraud that police regularly stake out ATMs, not in order to apprehend the fraudsters, but to question the little old ladies targeted by the scams, to make sure they know who they're sending their savings to. Banks rake in extortionary fees on these wire transfers and so have little incentive to change the system. Avoiding those fees means it's not uncommon for bonuses and even wages at respectable companies to be paid with envelopes full of cash. The match that lights all this kindling was a post-war anti-corruption law that required the government to publish the tax liabilities of top-earning individuals and corporations. Every year, the tabloids took great pleasure estimating the incomes of the rich and famous. The law was repeated in 2004, but this curiosity in the financial lives of others surely continues. Add to that historically lax reporting requirements and the temptation to imagine squirreling away tax-free money for a rainy day gains a whole new appeal. "For practical purposes, personal checking accounts don't exist. Credit cards have become widely accepted only in the last decade or so. Most financial transactions are done in cash or by wire transfer. When ATMs appeared in the 1970s, so did the ability to wire money via the ATM." That blew me out of the water the first time. Wire transfer? That's so...1975. WHO DOES THAT? Not only can I pay my bills online for "free," but my bank will cut a check and mail it for free (it's got to be cheaper than processing a personal check). Thanks to Utah's virtual DMV, I haven't been inside a physical DMV in years. Pundits praise how "connected" places like Japan and South Korea are, but getting truly practical things done with that connectedness is what matters in the end. A bigger surprise is hearing Japanese researchers praise the FDA as the model of a government agency. I can't begin to imagine the bureaucracy they must have to deal with. Diagnosis Murder did have an IRS-agent-as-detective (played by Holland Taylor who often plays sophisticated, rich mamas). In a couple of episodes, she shows up to audit people and ends up helping Dr. Sloan catch the bad guy. However, although she is a sympathetic character, she is played with the (American) "type" in mind. For example, in one episode, she complains that she is too "soft" on people. She is touched when Dr. Sloan assures her that she is as hard-nosed and merciless as any other IRS agent!